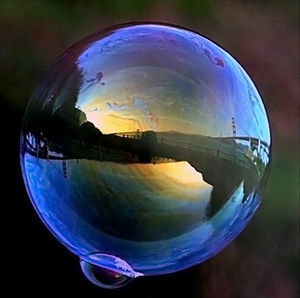 Home › Content Services Platforms › Content Management › What does a bubble smell like? Random thought – Read a tweet by @8OR15 that suggested the Twitter, Facebook and Groupon valuation run up smells like a bubble. I don’t disagree but I what I really like is the phrase. Begs the question – just what does a bubble smell like? I suppose it smells like whatever concoction makes up the thin film maintaining the surface tension. Until it bursts that is and then you get a whiff of whatever noxious gas is really taking up all the space. So what does a tech bubble smell like. Before it burst it smells like money. Rapidly expanding surface area filled with irrational exuberance and uninhibited optimism. From the inside – the outside world looks blurry and distorted. From outside looking in we see a reflection of ourselves and imagine how much better it would be inside. After the bubble pops the money disappears. All that is left hanging in the air is a smelly cloud of blame.